To the average person, an auto garage may not look as “finished” as a retail store, but this doesn’t mean there isn’t a carefully considered plan and set of high expectations for the finished product. Our commercial electrical work during the construction of four Firestone Auto Care Centers in the Seattle area has presented unique challenges to the All Wire team, and requires very careful attention to detail. Wiring a building made of cinder blocks requires a great deal of advanced planning and precise execution. Any conduits, wiring and outlet boxes are situated inside the cinder blocks so there is little room for error; any mistakes are going to be expensive mistakes. For this project, the wiring for the lifts, lighting, and fans was planned in advance with representatives from Firestone and then installed in conjunction with the masons laying the blocks. Conduits were run up the walls and into the attic space. From there wiring was run to the various lights, lifts and fans. A project such as this requires special equipment – something the All Wire team knows and is prepared for. From the lifts, wire pullers, and benders to the various drills and other cordless tools, our electricians have broad experience with the tools and techniques needed on a job like this one. From start to finish, All Wire successfully delivered these projects in a 3-month period, employing 3 or 4 electricians at any given time. 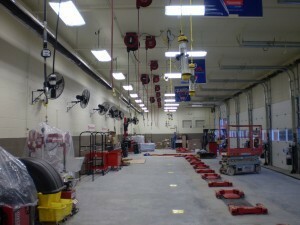 All Wire is proud of all the Firestone centers we have had the opportunity to work on. Our completion of four of these centers is a testament to All Wire’s commitment to quality work and customer satisfaction.